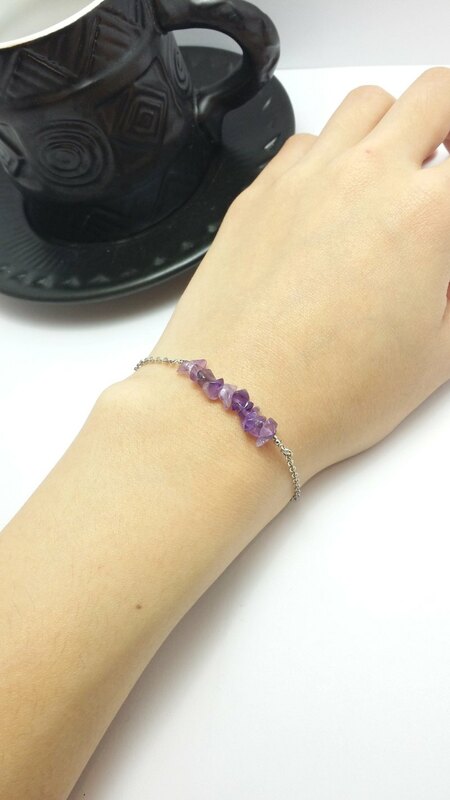 ** ◎ Product Specifications ◎ ** ● Product Features Irregular natural amethyst With stainless steel thin chain Small detail The use of stainless steel bracelets part Do not worry about black oxide difficult to maintain Yo :) ● Material: Natural amethyst / stainless steel chain ● Size: ** This discount will 2cm elongated chain Yo ** ** Size are all customizable Yo ** → hand circumference measurement can use paper, rope, tape and so on. Docile in the position you want to wear (usually wear a watch position) Do not deliberately taut, do the next mark before using the ruler to measure the public score, you can learn your hands around. ** Offer will be based on your hand when ordered around male scores plus points ** tightness public. ◎ tightness public score 1 cm (HT comfortable), 1.5 cm (normal micro pine) 2 cm (unrestrained freedom) ~ ◎ Product Size all can be adjusted according to personal preferences, as long as the message or remarks to me on the OK Hello ~ ** ● Be sure to inform the public when the next one hand around the tightness of scores + score Oh well ** ex: hand around 14 cm + 1.5 cm = 15.5 tightness ** Be sure to confirm the size again → before the next one, To modify the size of goods shall pay the return shipping costs and manual modification. ** ** ◎ Maintenance ◎ ** Natural crystal, pearls, shells, minerals, jade and other materials → Can be used wet toilet paper or cloth wipe. ● If you do not usually go out to play with the jewelry, Keep it in a box or zipper bag This can be extended to keep it beautiful state Yo! ** ※ Note ※ ** → real product may vary depending on shooting light and display different color on each computer screen, and will be some color ** **. → natural minerals, pearl, crystal, jade and other natural materials .... ** Due to the environment caused by the formation of neither the same every single color texture ** ** Also slightly small flaws might crack ** ** 100% and therefore can not exactly ** Images, It's like natural creations unique identity card ah ^ ^ But the production of every single material all items will be carefully selected to make good person, make sure to accept and then the next single Oh. → because every kind of commodity production are all natural ingredients, and every single natural stone sizes vary slightly, so after the completion of the length of the real product may have errors of about 0.3 cm, Not exactly the same size when ordering the optional. ** → Since all the buildings are all hand-made goods, will inevitably leave a little hand-made signs (can not be 100% symmetrical zero error) ** Such orders do not mind Oh. ** ● Be sure to accept the above considerations, then the next single Oh! ● ** ** ◎ origin / manufacture ◎ ** Taiwan's production of handmade ** ◎ ◎ ** Brand Story "Chōdo ii" January u-do for the Japanese chi い い pronunciation, Means "just right." How much promise a lot of things in life, just good enough. It was a very lazy but it will not make people comfortable balance. Want to make this hand temperature, to convey to you / u In fact, happiness is so simple and beautiful.